GWCS students are currently completing the PSSA tests in grades 3-8. 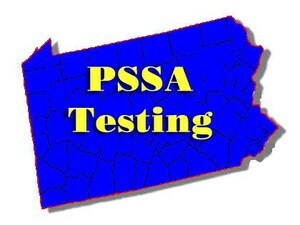 As you know, the PSSA’s are fast approaching. The testing will take place during periods 2 & 3. Class schedules will be slightly adjusted to ensure that all students have the opportunity to participate in Art, Gym, and Music. We have been working on PSSA test-taking skills and strategies over the past few weeks. Teachers have also been incorporating PSSA prep into their scheduled day. Our goal is to make sure the students feel comfortable and prepared when the testing starts. Be sure your child gets at least 9 hours of sleep. Make sure your child eats a healthy, protein-packed breakfast. Arrive to school on time. Any late arrivals will not permitted into the classroom until testing is over. Absences - If your child is absent for any reason, your child will be required to make up the missed portion of the test at a later date. Encourage your child to do his/her best! It is also important that your child understands the expectations of the testing environment. We are required to provide a silent testing environment, so all students must remain silent and seated until everyone in the classroom is finished testing. If your child finishes the test early, they may read silently at their desks. If there is a favorite book that your child would like to bring during the test days, we would encourage them to do so. Here are a few websites with additional information about how to support your child through the testing process.